If you live in the Nong Khai area then you can speak to the immigration officials about your 90 day reporting, a re-entry permit or extending your Thai tourist visa in Nong Khai. The costs for the visa extension in 1,900THB for a period of 30 days and the re-entry permits cost vary between single entry and multiple entry permits. We have listed the contact details for the immigration office below with a map and all their contact details in Nong Khai. If you wish to extend a family visa or a retirement O-A visa then speak to us online or walk into any of our offices in Thailand for assistance. 106 Moo 7 Amphoe Mueang, Changwat Nongkhai, 43000. Could you please tell me all of the documents i need for a retirement vtsa extension thankyou Colin. To get further advise regarding your visa extension, you may provide your contact number and we will call you and let you speak to our Thai Visa Specialist. Hi, I know that the Nong Khai/ Friendship Bridge closes at 10pm, but dont know what time immigration close. 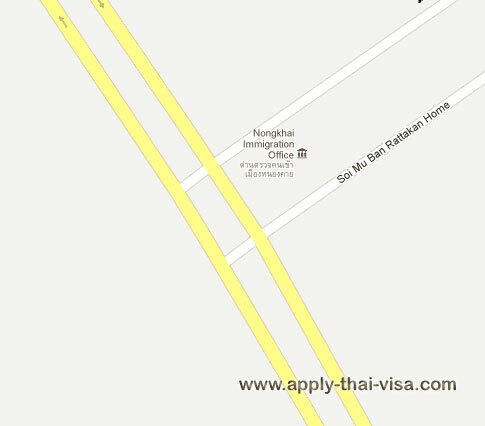 If I arrive at Nongkhai border at 8:00pm, is it possible to get visa on arrival desk at that time ??? The immigration section in most of the land border checkpoints in Thailand are only open from 8:00 AM to 4:30 PM. If you’ll arrive at the border outside their regular operating hour, you will have to wait until the immigration section reopens. Hi, I’m currently staying in Thailand on a single entry tourist visa which is diue to run out. Will I be able to cross the border at Nong Khai to Laos and apply for a multiple entry tourist visa so I can stay in Thailand a little longer? You may be able to apply for a single-entry tourist visa in Laos. If you wish to apply for the multiple-entry visa, you will have to obtain it from the Thai Embassy in your home country. Hi, I’m an Indian national currently travelling in Laos. I want to cross the boarder back to Thailand to take a flight from Bangkok. I recently had a Thai tourist visa on arrival that expired 10 days ago. Would I be able to get another VOA at Nong Khai, and if so what documents would I require? It’s best that you contact the Thai Embassy or Consulate in Laos to confirm if the Immigration Section at Nong Khai border is actually issuing Visa On Arrival to foreigners. I am an English language teacher in Bangkok, I have Non B, work permit and teacher’s license under a school in Bangkok, if by the end of my contract, I have a new school to teacher there in Nongkhai province, do I have to go out of Thailand to change my visa or I will change it at Nomgkhai immigration office? If possible to change in Nomgkhai immigration office, what are the documents that I have to take at the immigration office and the date to go to immigration office? Yes, you have to apply for another Non Immigrant ​B visa from outside Thailand and apply for a new work permit upon return with the documents from the school you will transfer to.